Not that I need more motivation to read, but I recently joined a blogger book club organized by Sarah, of SarahOhm.com. 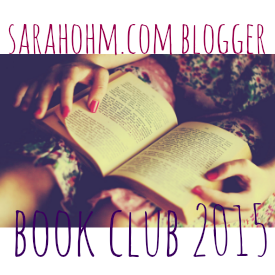 Each month, our little group tackles a different theme, then we all blog our thoughts about our chosen book at the end of the month. I've always wanted to be part of a book club, so I thought this would be fun to try, although I'm not sure it's quite the intimate gab fest I imagined it to be as we're all reading different books. This month's theme was "motivation" and I was pretty stumped at first as I'm not one to read self-help books, which I find dreadfully boring. Motivational books seem like the type of thing that one "should" read and reading to me has always been more about curiosity and joy rather than "education." Luckily, another member posted a handy Amazon list of books to try and I stumbled onto Wherever you go, there you are by Jon Kabat-Zinn. 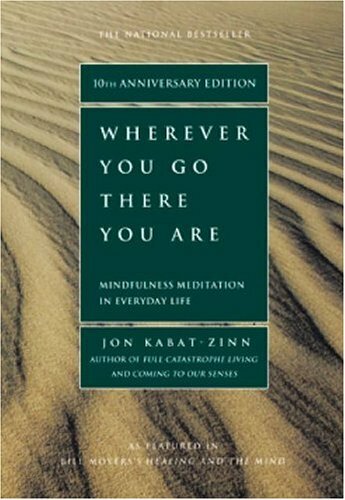 Wherever you go, there you are by Jon Kabat-Zinn is a Westerner's take on incorporating the practice of meditation into your life. Designed to appeal to non-spiritual people, Kabat-Zinn expounds on the virtues and practicalities that meditation can have. I've always had an interest in Buddhism and meditation, so I was game to read more. 1. Take moments through the day to just stop what you're doing and tell yourself "this is it." This isn't meant to be depressing, but instead liberating as it is telling you that you can worry all you want about the past or the future, but the only thing that really matters and exists, is the present. Stop and really try to be present in this moment: how do you feel? What does your body tell you? What is happening around you that you have never noticed before? 2. Once you are really aware of your present and surroundings, you can start to analyze that storm inside you that is your emotions. Where did they come from? What outcomes can you take from them? Sometime we are so immersed in our own maelstrom that we don't see how insignificant they are, or the pettiness that triggers it. 3. Meditation isn't about clearing your mind, or about being a positive person; it is more about separating yourself to see things as they are. It can be frightening to have no illusions. Being perfectly vulnerable to yourself and all your weaknesses is scary stuff, but ultimately if you want to develop as a person, you're going to have to face yourself as you are. My own impatience with this book probably says something about my development as a peaceful person! I have tried though to take the above to heart and in the short time since I started reading this book, I think it has actually helped me a little! Forcing myself to be in the moment, whenever possible, is actually refreshing to the mind. Rather than trying to cram my brain with all the million to-dos, I just let myself walk the street and instead concentrate on noticing the sunlight, or the crispness of the air. I get to the same destination, but I feel more relaxed and equipped to deal with what comes next. Have you ever tried meditation before? Tell your experience! You can purchase your own copy of Wherever you go, there you are on Amazon. And don't forget to join me for next month's theme: Love story!